HAPPY NEW YEAR 2019 FROM THE MOCAPLAB TEAM AT THE ARC DE TRIOMPHE! Special thanks to ATHEM for letting us be part of this fabulous project where once again we are able to use our hand, finger and sign language technology to create something quite magical for the new year, capturing the subtleties of gesture through motion capture! 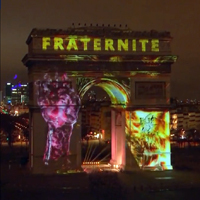 A great way to see the new year in from the iconic Arc de Triomphe in Paris! Wishing you all health, happiness and success for 2019!